Large concrete sign? A good sign! A ‘New Town’ in the UK sense is a planned city meant for post-WWII population dispersal. 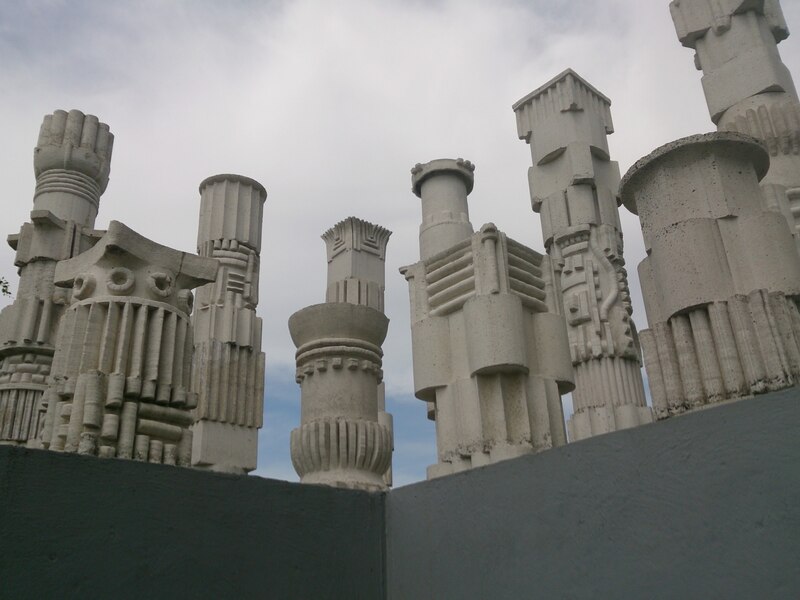 They are known for soullessness accentuated by brutalist architecture and disjointed attempts at public art. As a foreigner in the UK, I find these ‘New Towns’ fascinating. Unlike towns that grow up naturally over time, the New Towns were thrown up in one moment with one general type of architecture. The only thing to go up since seems to be big-box stores and megamarkets: brutality and commercialism. Visiting is an experience. I recently developed a small obsession with brutalist architecture so when my friend suggested we visit the New Town of Glenrothes while I was up in Fife this weekend, I said ‘yes please’. He called it a ‘brutalist dream’. We got in the car, left his gorgeous village (dripping with ‘heritage’. Picts! Robert the Bruce! Secret Queens! Fossils! ), and drove into the planned unknown. 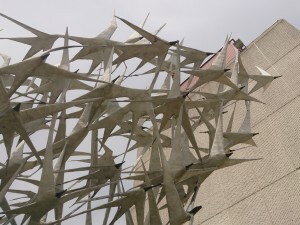 Brutal birds flying outside of one of Glenrothes’ many brutalist buildings. One astounding aspect of Glenrothes is that its town centre is a shopping mall. Literally. The public library and other public buildings are in this mall; the mall walkways have street names and larger areas have square names; the doors are all entitled things like ‘Unicorn Gate’ and ‘Lyon Gate’. I mean it: the town high street IS the main mall walkway. According to wikipedia, the mall-ification of Glenrothes’ town centre only came about in 1976 when everyone just sort of gave up on a traditional public square space. There are indoor public spaces (mostly unused) and it is clear people are meant to drive to the mall/centre of town and do mall/centre of town things. Outside of the mall/centre of town are a number of brutalist structures, concrete streaked in the Scottish wet. 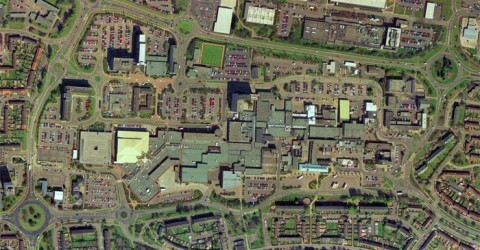 To quote the Scotsman “the buildings huddled around Glenrothes’s Kingdom Shopping Centre are almost uniformly grim”. Further afield a vast park stretches into infinity. Sprinkled throughout all this are sculptures which, apparently, are meant to match aspects of Glenrothes, but those aspects are unclear. There is little or no signage. This sculpture is called ‘The Heritage’. 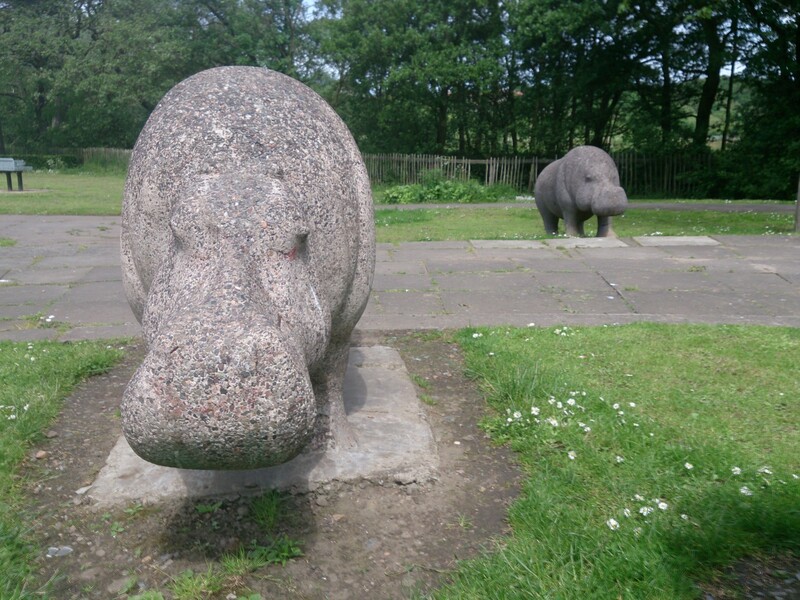 It was once perfectly placed outside one of Glenrothes’ brutalist structures but has since been moved to the park because, presumably, the irony was too much for someone. 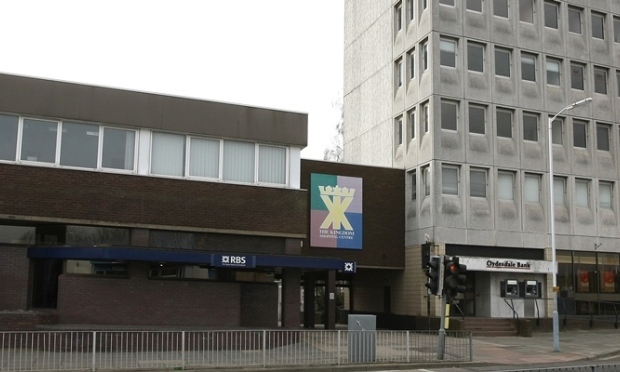 In 2009 Glenrothes was deemed the ‘most dismal town in Scotland’ by the architectural magazine Prospect. I can honestly say that there were more interesting things to see in Glenrothes than in the other ‘historic’, tourist locations that I have visited recently. I (and I think many people) instantly think ‘this is the last place on earth I want to live’ the moment I foot in a New Town. They lack something, but it is unclear what they lack. My friend and I discussed this at length: what went wrong with these New Towns? What couldn’t their founders create? Why is St. Andrews or his own village lovely, successful, soulful and why is Glenrothes the place you go to if you absolutely have to buy something at a big box store? We could see how the founders sincerely tried to give Glenrothes ‘culture’ and ‘heritage’, why didn’t culture and heritage build up? 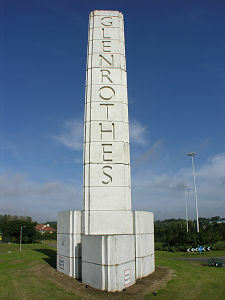 One of the entrances to Glenrothes town centre/high street. The New Town was built ‘fast’ and anything that happens fast happens wrong. We humans are slow creatures. By creating a whole town from start to finish, all aspects of it are instantly institutionalised: culture and tradition cannot grow up organically because it is all pre-ordained on high. We people are big on inertia. Unplanned towns grow up at places of interest: places where people naturally gravitate because of landscape features: a bay, a navigable river, a forest edge, etc. New Towns jostled, forced collections of people. No history of higher education, research, and learning and thus no gravitation of those sorts to the place. Also no upper/elite class. Issues with interaction with nature. The ‘pride of place’ issue. There isn’t any. Oh there were other things we thought up too but I’ve forgotten most of them. Really we have no real answer other than you can’t just set out to create culture and, apparently, you can’t invent tradition that easily. Glenrothes has quite a hippo infestation. 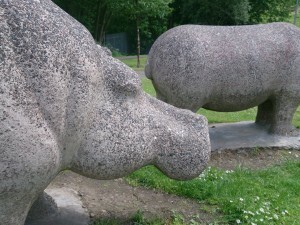 Even the wildlife is made of concrete. As my friend and I ate ice cream on a bench outside of the inside town centre, we wondered why there wasn’t more ‘pride of place’ in the heritage of BEING a new town. I had quite a few questions about the plan, the history of it, etc, but for all the public art there were no signs about town conception and town history. Yet there is a sense of new town shame: like a thin veneer of ‘respectability’ keeps being painting over the New Town in hopes no one notices what it really is. That shame is a shame. We can only guess that it is too soon to tell the New Town story as a point of pride: some of the first generation to move there is still alive anyhow. I wonder if anyone we encountered, we two foreigners looking around with big eyes and taking photos, realized we were tourists. ‘Tourist attraction’ probably isn’t how they envision their town. Maybe they should. And maybe I will slowly visit all the New Towns.